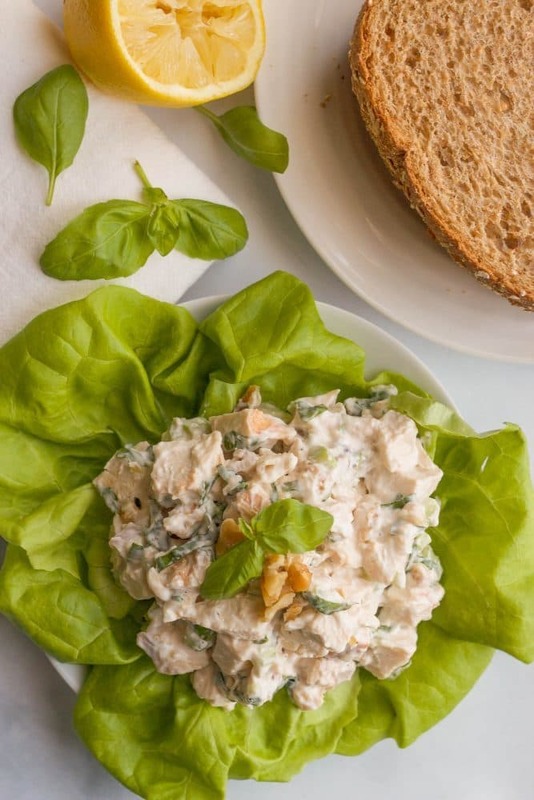 A creamy but healthy basil chicken salad with fresh basil and chopped walnuts – great as a sandwich, wrap or lettuce wrap, or paired with crackers! Check out my new VIDEO for this recipe! We are back from spring break and *mostly* back into the swing of things. M loved riding her boogie board around the very shallow part of the ocean where the waves came crashing in. And she made a lot of “cookie balls” out of sand. (She is so my daughter, always thinking about the food! J was hilarious, chasing after the sandpipers on the beach. His short, stocky little 2-year-old legs carrying him as fast as they could go; cracked us all up! But back in the real world, where my toes won’t be in the sand most of the day, I’ve got breakfasts and lunches to prep and the daily dinner to fix. And earlier this year, my husband said he wanted to venture away from his standard turkey sandwich and rotate his work lunches a bit more. 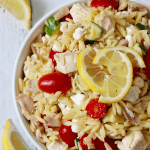 Usually it means some version of leftovers, but I’ve also been fixing more salads (like my tuna spinach salad, chicken quinoa salad with salsa hummus or southwestern orzo salad) for him to take and for the kiddos and I to share in as well. And this healthy basil chicken salad with walnuts is one of our new favorites. I had some extra basil that I wanted to use up and while I was staring at it, demanding it to send me some vibes of inspiration, I spied some leftover chicken and realized I had a few celery stalks in the veggie bin. 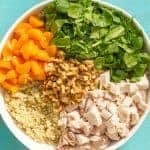 I hate wasting food and all of those things together just jumped up and demanded to be folded into a healthy basil chicken salad! 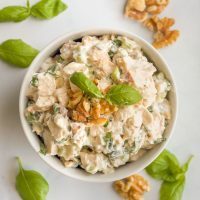 The result is a creamy, hearty salad with chunks of chicken, bright fresh basil for an herbilicious dimension and crunchy walnut bits scattered throughout it. I use half-mayo and half-Greek yogurt, which adds a boost of protein, a shot of healthfulness and a silky smooth texture to the creamy mix. My husband texted me from work how good his chicken salad sandwich was, which is a total win. He took it again the next day and wanted to take it three days in a row (so much for variety, right?!) but I had already finished off the last of it! 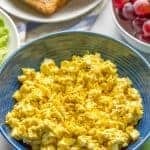 I use both mayonnaise and Greek yogurt in this recipe, but you could certainly use all mayonnaise or all Greek yogurt if you prefer. 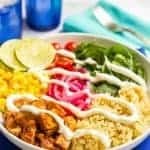 I go a bit light on the mayonnaise and Greek yogurt so I can taste all the fresh flavors, but you can add a bit of extra if you want a super duper creamy chicken salad. Walnuts are one of my favorites and I always have some on hand, but you could definitely substitute pecans or your favorite nut. Or just leave them out if you’d rather. And we’ve got lots of options on how to enjoy this! 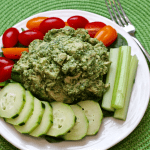 – Make a salad with your chicken salad! Add a scoop of chicken salad to some mixed greens and tomatoes. Me, I like it all the ways! And you’ll find me eating it on repeat this spring and summer for a perfect light and healthy lunch, particularly once I have basil planted in my garden outside. 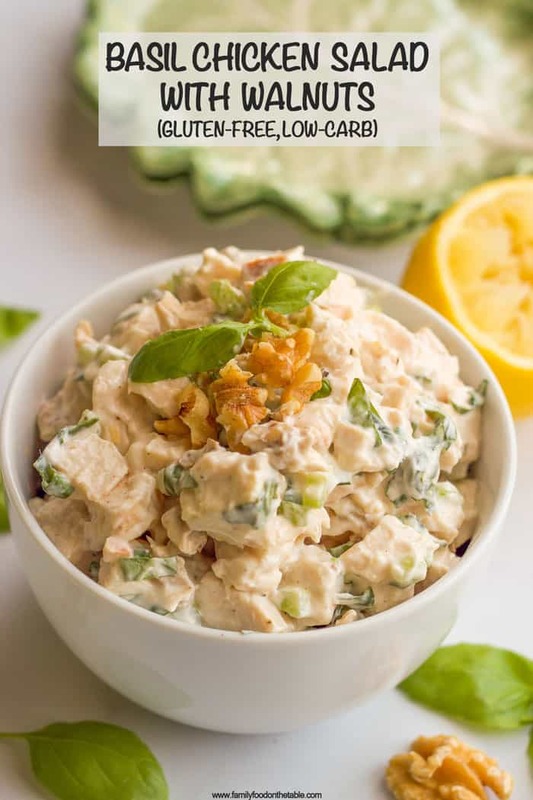 So if you’re tired of the same old lunch day in and day out, give this healthy chicken salad a try and enjoy the fresh flavors! 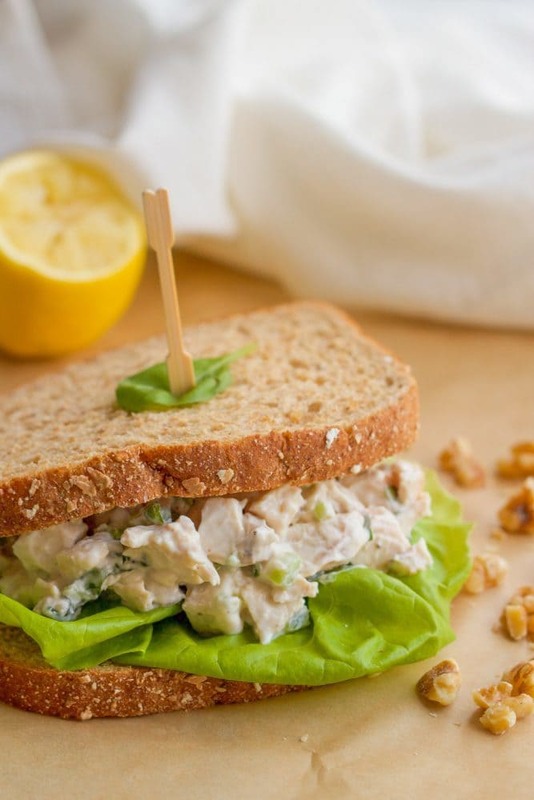 A creamy but healthy chicken salad with fresh basil and chopped walnuts, perfect for lunch! 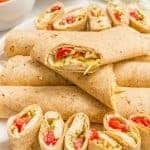 Serve as a sandwich, wrap, lettuce wrap or with crackers and cheese. Leftovers can be kept in the fridge for 4-5 days. You can use leftover grilled or roasted chicken here or a rotisserie chicken from the store. 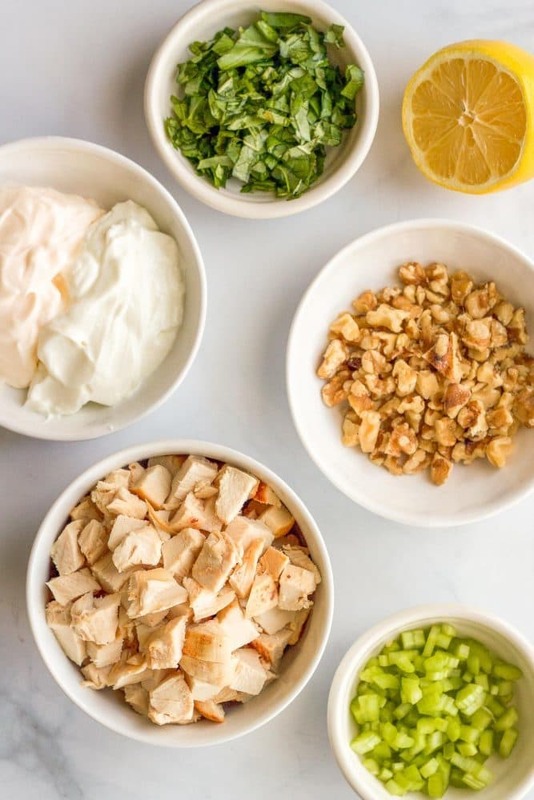 You can increase the mayonnaise and Greek yogurt to 1/4 cup each if you prefer an extra creamy chicken salad. You can also use all mayonnaise or all Greek yogurt for this salad if you prefer. You could also sub out pecans or another nut for the walnuts. Or leave them out. Lovely sandwich, makes me soooo hungry! Yay for fresh garden basil! I know what ya mean. Sometimes we you take a little break or vacay when you get back, you almost need another break just to get back into the swing of things. 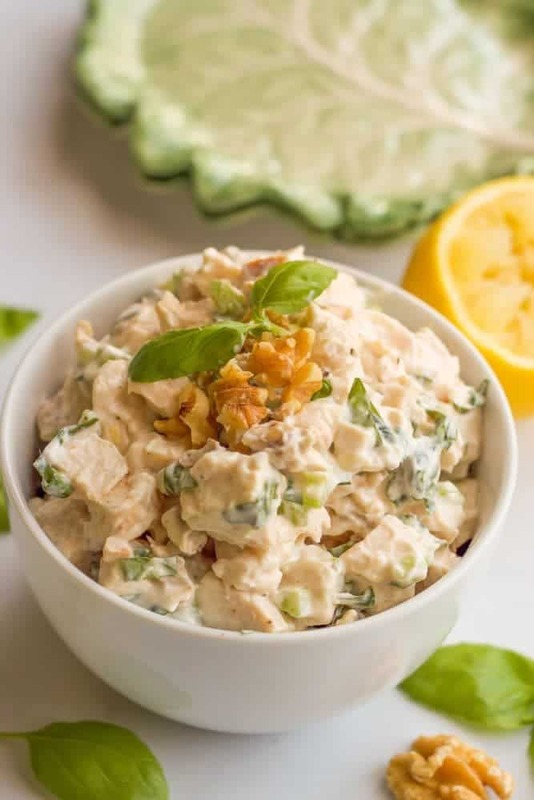 I love chicken salad and this version looks so delicious, Kathryn! Loving the twist with the basil and walnuts. What a lovely combo. So good that you used some yogurt in there as well so it wasn’t all mayo. Great idea, girl. Going to have to try this one soon for sure 🙂 PINNED! A vacation from your vacation is always somehow needed. Guess that just means we live it up, right?! Have a great week Dawn! It sounds like you had a fantastic time in Florida! I would love a beach vacation right about now. I really need to get more creative with my lunches these days too. 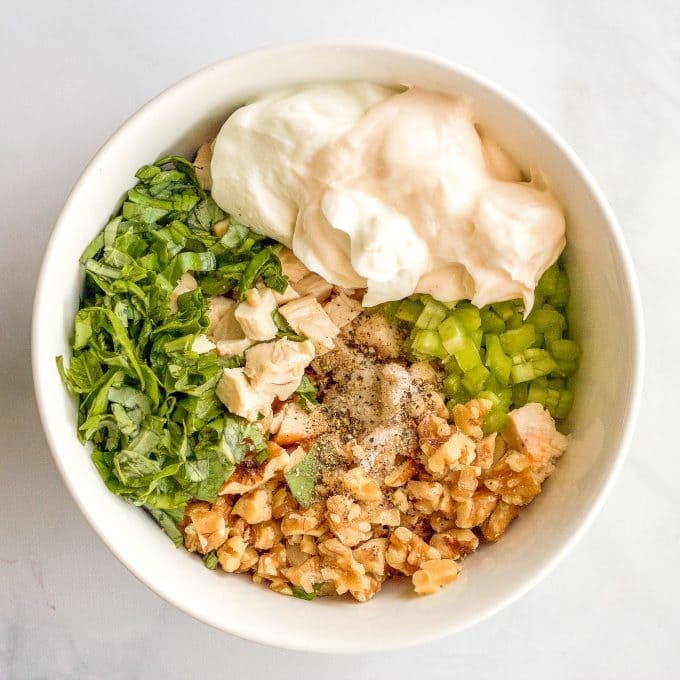 I’m definitely adding this chicken salad into the rotation! Thanks for sharing at the Whats for Dinner LInky party! Thanks Barbara! I think it makes for a perfectly balanced creamy mix! Love the basil and walnuts! Really adds a lot to it!